A ship of the coast of Sunnydale is attacked by Angelus who takes an ancient demon’s armour back to his hideout. 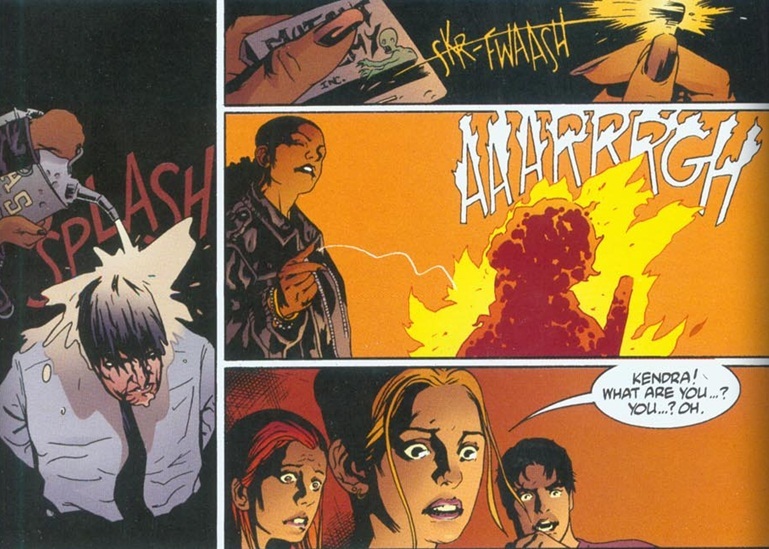 At school the Scoobies are dealing with a detached and emotional Giles. Buffy checks the downed ship and has to flee some federal agents, she runs into Giles at the cemetery. 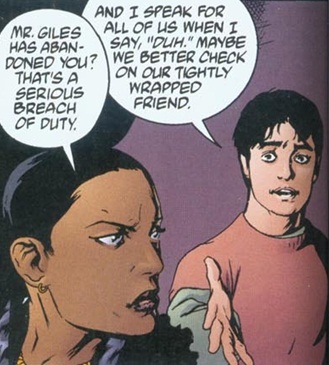 Angelus captures Giles to help him with his plan while the scoobies realize that what Angelus is after spells “the end of the world”. The villains get the demon’s body they need to resurrect him and his army; Drusilla makes plans with the demon to betray both Angelus and Spike once they resurrect him. Buffy is locked in prison by the mysterious agents but gets saved by Kendra. They join up with the scoobies while Giles learns that he could use the same ritual Angelus will use to bring back his dead Girlfriend. By the time the Scoobies reach Angelus they perform the ritual and the demon is reborn and with him a giant fire breathing Bird. The team escapes and track down an agent who Kendra reveals is a demon. The team also realizes Giles plans to resurrect Jenny. Our Slayers attack the demons while Angelus and Spike take on the giant bird. Giles performs the ritual and finally gets closure from Jenny. He returns to the scoobies in time to help them destroy the giant bird after Angelus kills the demon. With the day saved the Scoobies and Kendra prepare for the next battle. Characterization- Spot on, Doug Petrie has a great handle on the characters and their inner voices. Every single character behaved and said just what you would expect from the cast of Buffy circa Season 2. Angel and Spike bicker, Xander has the witty quips, Kendra is all about business and Giles is still very emotional about his girlfriend’s death, spot on! Art- For the most part Ryan Sook captures the likeness of the characters and his art conveys the over the top action the series is known for. Action- Fights, fire, explosions…oh and giant Fire breathing birds too! I loved every second of it! 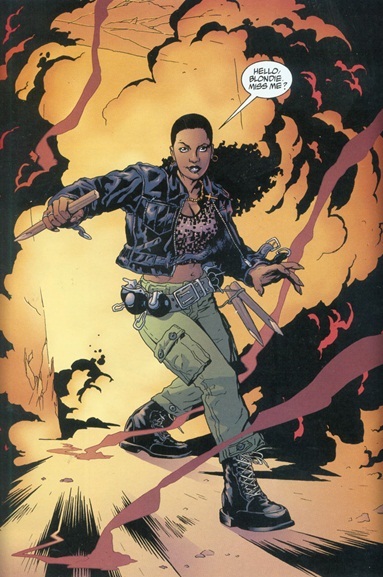 More Kendra– For those who always lamented the minimal use of Bianca Lawson’s Kendra the Vampire Slayer this is the comic for you! Kendra swoops in saves the day in her “old world, traditional slayer” kinda way. I got a real kick watching her in action. NB: Joss we know you’re busy with the Avenger Movie and Buffy Season 9 but we would kill for some more Kendra action! Cover- Passable at best, just a photoshop of Buffy and evil Angel with a bunch of random symbols that play into the story, has a washed out colour palette too which hasn’t aged well. Art- Not very detailed and the worst part was Drusilla, she was definitely not in the likeness of Juliet Landau.